Ariens Riding Lawn Mowers - Dominate Your Lawn With A Quality Ariens Mower! 1.3 Ariens Riding Lawn Mowers – Are They Any Good? Spring is here, and that means lawns across the country will soon be begging for attention. In fact, with warmer-than-normal temperatures descending upon much of the nation, many of you have probably been forced to get the party started early this year. 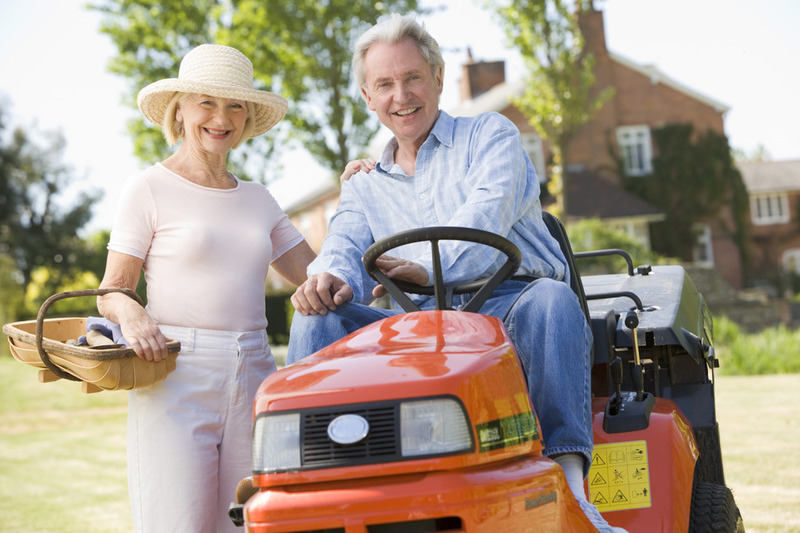 Maintaining your property certainly takes some level of skill and dedication, but as you’re more than likely aware, your lawn and garden equipment is a major part of the equation. This is why Ariens Riding Lawn Mowers are well worth considering. It’s no secret some lawn mowers are better than others. Though certain models make mowing the lawn feel more like leisurely Sunday drive than a chore, others leave you wondering if tackling the task with a pair of safety scissors might’ve been a better option. The Ariens Riding Lawn Mowers brand has graced the market for more than 80 years now, and it has become a favorite among professional landscapers and do-it-yourself homeowners alike. In a Hurry? Check Out the Ariens Zoom 34 Riding Mower Here! Few among us haven’t experienced the “joys” of mowing the entire surroundings of our childhood homes with a push mower. No doubt, almost as many of us remember the sense of pride, accomplishment, and even relief, when dad finally entrusted us with the keys to his prized lawn tractor. Of course, it didn’t take long to learn operating that riding mower wasn’t exactly as simple and efficient as dad always made it seem. Enter the zero turn mower. This type of technology once reserved for those operating on a business budget is now widely available on a civilian level. Homeowners, rejoice. With a zero turn model, you no longer have to turn wide, swing back around and make a quick run back over the yard to cover those little strips of grass you missed on the first pass. Along with this major selling point come a number of additional benefits. Ease of Operation: Rather than a steering wheel, zero turn mowers have control arms. Push them forward, that’s where you go; pull them back, you go in reverse. Turning is as simple as pushing the right or left arm, and returning them to their starting positions brings you to a stop. A little practice placing just the right amount of pressure on the controls is all you need to become a pro. Improved Speed: The previous generation in ride-on mowers is capable of going about four M.P.H. at top speed; on the other hand, zero turns have the capacity to double that speed. This is one of the reasons they allow you to mow your lawn in half the time as compared to the alternative. Greater Maneuverability: With a zero turn mower, you can easily run circles around trees and birdbaths, zip along the edges of intricately shaped flower beds and conform to any other hurdles your lawn may hold in store. You may still need to break out the weed eater for some tight corners and hard-to-reach crevices, but you’ll eliminate the need to back up, pull forward, inch over and repeat. Lower Fuel Consumption: Since less time and effort are required when using a zero turn mower, you’ll also need less fuel per cut. Though this type of technology tends to cost a bit more up front, most admit the reduced cost of fuel more than offsets the initial price of the mower. More Power: Zero turn models typically offer wider decks than their counterparts, and they’re built with two transmissions as well as a more beefed up engine. Each rear wheel also has its own motor. All these components combine to create a power house of cutting capability. These are all general points of interest. Each model is different and offers its own specific set of features. You’ll also find a number of attachments available for these models, making your lawn maintenance adventure more effortless, efficient and convenient. In short, you could say they’re customizable to meet your unique list of needs. Ariens caters to an array of year-round lawn care needs from snow blowers to tools for putting on the finishing touches. The company also offers the traditional walk-behind mowers and lawn tractors. Their selection of zero turn mowers accommodates a range of job sizes and is accompanied by a number of accessories for various extra requirements. With a 34” cutting width, the Zoom 34 comes with a Kohler 6000 Series V-Twin 19 HP engine. This model is recommended for smaller to medium yards and was designed to fit through standard 36” gates for greater convenience and mobility. A Hydro-Gear EZT fully integrated transmission eliminates the need for shifting while tending to your lawn. This would be the next step up from the Zoom 34. A residential model like its predecessor, the Zoom series 42” model is driven by a Kohler 6600 Series V-Twin, also churning out 19HP/660cc. Its fully welded steel frame generates less vibration than some riding mowers on the market, and this model has been said to handle medium sized yards without protest. Under the hood of the Zoom 50” version is a 21HP/660cc Kohler 6000 Series V-Twin OHV engine delivering 17,800 feet per minute blade tip speed. As a larger and more powerful option, the Zoom 50 comes equipped with a trailer hitch and control arm dampeners to help take the edge off the extra muscle. At this point, you’re getting into the semi-professional realm of the Ariens collection. The 52” zero turn mower gives you a 23 HP/725cc Kohler Courage Twin engine. Among its commercial-grade features are a Hydro-Gear ZT3100 transmission, a 5” deck shell geared toward tougher terrain and rougher obstacles and a welded tubular steel frame construction. With this mid-grade model, you’ll be riding behind a Kohler V-Twin 22 HP/725cc 7,000 Series OHV engine. Its deck is adjustable to thirteen different cutting positions, and it comes complete with 300 pounds of towing capacity. This particular model is a lawn tractor rather than a zero turn mower. It features a 22 HP V-Twin Briggs & Stratton engine as well as a 46” cutting deck. The company’s ReadyStart technology ensures it’s always up for the job at hand. It offers the durability with which Ariens has become synonymous. All Ariens zero turn models are designed with power, durability and the needs of the operator in mind. They feature adjustable control arms for greater comfort and foot lifts for easy raising and lowering of the cutting deck. Vacuum and bagging systems, sprayers, spreaders, trailers and a variety of other attachments are available for Ariens mowers depending on just how far you plan to take your lawn maintenance efforts. Ariens Riding Lawn Mowers – Are They Any Good? General consensus answers with a resounding “yes”. For the most part, current owners give the Ariens zero turn lineup a 4.5 to 5 star rating, touting the company’s mowers for their durability, design and performance as well as overall value. They feature more power than your typical lawn tractor and are built to withstand not only repetitive use, but the potential pitfalls of average, as well as not-so-average, lawns. We definitely recommend them.